Showing 8 articles from February 24, 2014. SOUTH BEND – A wide range of cases were heard in Pacific County Superior Court Friday. There were cases involving the theft of city funds, burglaries, and of course, methamphetamine and other drugs. All three local law enforcement agencies have made several arrests in the past few weeks; many of which are outlined below. Tricia Marie Belcher was in Superior Court Friday for her trial setting. Belcher, the former municipal court clerk for the city of South Bend, is charged with theft in the first degree while employed with the city of South Bend. More than $15,000 in funds were misappropriated. Belcher is being represented by Harold Karlsvik. When you talk to Raymond resident, Bob Dzutsoff, he recalls a time when families would travel from Raymond to South Bend and on to Tokeland for a picnic taking a nickel street car and a ten cent ferry ride to spend the day and return. 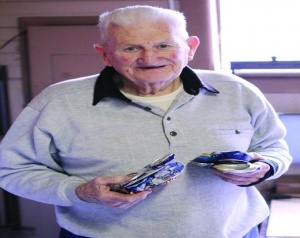 Now at 91, Dzutsoff, a World War II veteran, retired Longshoreman, spends his days collecting aluminum cans. It is not because he needs the money to make ends meet or that he thinks the cans are a littering problem, but he uses the cans that he collects, cashes them in and gives the money to charity. For Dzutzoff, it is all about the kids. This coming May, the Public Market on the Willapa will be open for 18 years. Many may say that this is nothing special, not 50 years or even 25, but if you have not been to the Public Market in a while, it may be a good time to find out what is going on. Photo by Scot Pearson Randy’s Family Fitness will be moving from its current Peters Street location but offering the same ability to “stay fit”. Randy Henneman is packing up and moving out…but only just down the road. 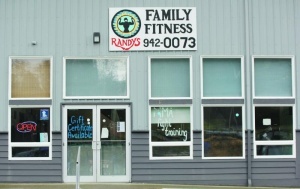 The current location of Randy’s Family Fitness on Peters Street will be closing as Henneman relocates the facility to his new Third Street location by the Raymond Theatre. Photo by Larry Bale Willapa Valley HS senior Anthony Sagen stepped up and answered the call with a solid District IV tournament. 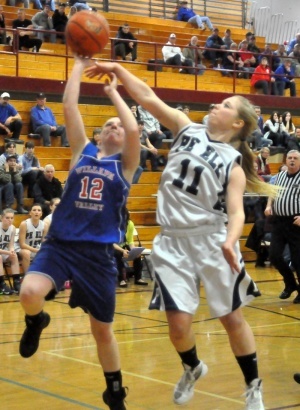 Willapa Valley qualified for the 16-team regional affair by defeating North Beach 46-37 Friday evening at Rochester in the District IV Basketball Tournament. 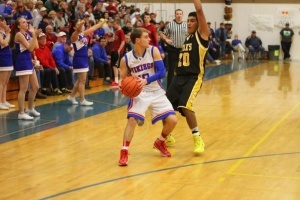 Anthony Sagen shot in 17 points to lead Valley. Photo by Steve Rogers Willapa Valley's Alicia Smarciaz is defended by PeEll's Andi Alden in Saturday's District IV tournament, which saw the Vikes edge the Trojans to stay alive and move on to regional competition. Willapa Valley is headed to the 16-team regional tournament format with a chance to go to State this weekend. The Vikings (19-5) of first-year head coach and Pacific League Coach of the Year Matt Bannish play this Saturday at 4 p.m. in Ellensburg against highly regarded Northwest Christian of Colbert. Valley got its regional berth by defeating Pe Ell 35-26 at W.F. West High School in the District IV tournament. During the last City of Raymond Council Meeting, Feb. 18, several items were on the agenda but none possibly as important as the preparation for the new business of marijuana.